Our flight arrived at 8pm and we drove from the airport over the 4000m pass to Huanglong (55km / 1hr). Our driver from Sichuanfun Taxis didn’t speak any English and neither did the staff at the Seercuo International Hotel (2900m) where we stayed overnight. We got up early to ascend part-way by cable car and walk down slowly - as keen photographers, it took us about 5+ hours to do the walk (many do it in 3 to 4 hours). The 4.2 mile circular route is on boardwalks that are immaculately clean – there are waste bins every 50 to 100 metres and cleaners sweeping the paths and picking up any rubbish. There are frequent toilet blocks along the route. Oxygen canisters are sold at the many stalls along the route. Cost – entrance to the park is 200RMB + 80RMB for the cable car (it operates April to November). Hualong is a stunning park. We were there at the end of the dry season but it was still beautiful. There are pictures around that show you what a particular area is like with more water. As well as the pools, there is a large temple and caves. On the way down, we passed all the key sights: Flamboyant Pond (the largest group of ponds, made up of 700 pools of water), Huanglong Temple (built during the Ming Dynasty, it combines Buddhism and Taoism. ), Multi-coloured pond, the caves, the Mirror Pool, the Golden Sand Beach and some waterfalls. At 4pm we drove to Jiuzhaigou - 127 km / 2hr 40m Huanglong, which means 'Yellow Dragon', is renowned for its cascade of colourful pools and natural ponds that tumble down a 3.6km beautiful gully which are said to shimmer like the scales of a 'yellow dragon'. The astounding variety of greens, blues and yellows that colour the pools are caused by natural calcite deposits in the water and concentrations of algae. Yellow Dragon Gully itself is surrounded by forests of spruce trees at the lower altitudes, and alpine meadows and permanently snow-capped peaks and glaciers further up. The endangered Golden Snub-Nosed Monkeys and Giant Panda both call it home. 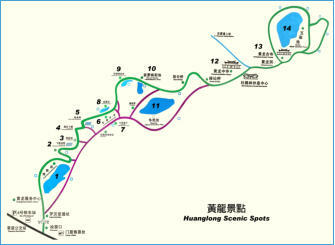 Huanglong was declared a UNESCO World Heritage Site in 1992. Travertine - Travertine is a type of limestone formed by the build-up of minerals from spring water. It‘s usually porous, which makes it easy for colourful plants and algae to grow in and on top of it. Build-ups of travertine often take the shape of terraces, which Huanglong is famous for. Altitude Sickness: Thankfully we didn’t suffer, but many visitors do experience altitude sickness especially during an overnight or two night stay. The first aid centre at the airport has small canisters of oxygen and Tibetan herbal medicine for sale. The airport is at an elevation of is 3,448 meters (11,312 ft), and most of Hualong Park lies between 2,000 meters (6,561 feet) and 3,600 meters (11,811feet), although you need to drive over a 4000 metre pass to get there. Small canisters of oxygen can be purchased from stalls in the park.